This photo shows a remnant of the 1857 Military Road from Steilacoom to Whatcom county, surveyed by W.W. [Walter Washington] DeLacy, who is profiled below. When DeLacy reached Whatcom, he was hired by a committee of settlers to complete a trail from Bellingham Bay to the Fraser River in British Columbia, where discovery of placer gold inspired a brief gold rush in 1858. The photo is courtesy of the Paul Dorpat and the Seattle Times, which posted this article, including information about Karen Meador, historian of the Old Military Road. 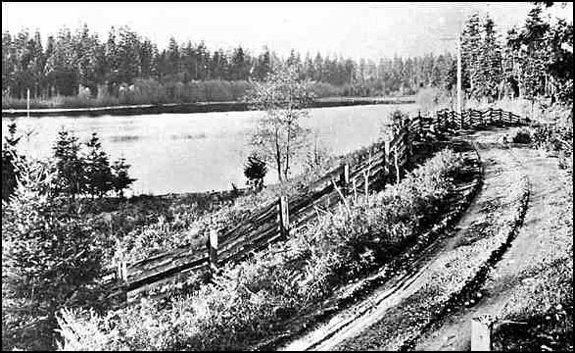 During the summer of 1856, U.S. Army Colonel W.W. deLacy (one source notes Captain) surveyed what is now called the Old Military Road, the original mud-path route between Steilacoom and Fort Bellingham. Walter Washington deLacy accomplished this feat over nearly a dozen rivers and hills with the help of six Indians, three settlers, a pocket compass and an ax to blaze marks on trees. Actual clearing and primitive grading began in 1857. Jefferson Davis, who was Secretary of War in those pre-Civil War days, ordered the road construction in response to the Indian wars that flared up wherever U.S. settlers encroached upon ancient tribal lands, and further impetus was provided when the Pig War threatened the peace of American settlers alongside British subjects in the San Juan Islands. DeLacy was instructed to locate the road inland wherever possible, about five miles beyond the range of the artillery range of Britain's naval warships. Karen Meador, the Old Military Road historian, found parts of the extant road near Federal Way in the early 2000s. When deLacy reached Whatcom County, the first reports of placer-gold discoveries were coming in from the Fraser River district of British Columbia (B.C.). On Jan. 5, 1857, the Whatcom County board of supervisors appointed three settlers, Russell A. Peabody, Charles Vail, and James Carr to "view" a road from Bellingham Bay to a crossing of the Nooksack River near what is now the Canadian border. After he connected the original Military Road with what since has been called Telegraph Road — named for the telegraph route instituted a decade later, deLacy was soon hired by an ad hoc committee of boosters from the village of Whatcom. Underfunded and undermanned, he laboriously blazed a trail from the original Whatcom-Fraser River trail past Chilliwack Lake and then northeast up the Skagit river watershed north of the boundary to a point where the original Brigade Trail of the 1840s met the Tulameen river. During our original research we found that DeLacy left surprisingly little as far as written records or accounts of his Washington activities; most of the information about his trail is derived from the Northern Light newspaper. One odd detail popped out at us as we looked at the 1983 book by James W. Scott and Daniel E. Turbeville III, Whatcom County in Maps, 1832-1937. This book is invaluable to the researcher and one of the maps included is the plat map for Sehome, which deLacy, noted as a civil engineer, drew for Fitzhugh, Vail and other landholders of the early town on May 8, 1858. Although his name on the legend is handwritten deLacy, there is a DeLacey street on the map. Was it named for him and why that way? Indeed, many records spell the deLacy name with that variation. (Do we have another Olmsted/Olmstead conflict?) We also wonder if he was given lots during the boom for his efforts, partly in lieu for cash? We also know from author Percival Jeffcott's notes that deLacy laid out the Guide Meridian Road north from Whatcom. To complicate matters further for the researcher, we found this detail at a website for Thurston County — "Lacey. This city, located three miles east of Olympia (Sec.21, T18N, R1W), was incorporated in 1966. It was originally named Woodland for Isaac and Catherine Wood, for their [Donation Land Claim" filed in 1853. But the name for the post office had to be changed as there was another Woodland in southern Washington, on the same railroad line. O.C. deLacey, an attorney and land developer wishing to develop the community, filed to have the name changed to 'Lacey'. The town was distinguished as the best horse racing site on the west coast. It is now the second largest city in the county." We have not found any other reference to deLacey after he signed the naming petition in 1891.
deLacy was a Virginia native We have learned much more about W.W. deLacy since this article was posted, and especially since one of his descendants contacted us: John DeLacy of Portland, Oregon, who traces his lineage back through his great-great grandfather, who was apparently W.W. deLacy's brother. He helped us finally correct the spelling of deLacy's first and middle names: Walter Washington. His paternal grandfather was a native of Wexford, Ireland, and a descendant of the celebrated Norman knight, Hugh deLacy, who acted as first Norman Governor of Ireland under Henry II, in 1172. His maternal grandfather was an Englishman by the name of William Charles Lee, who for many years was English Vice-Consul at Oporto, Portugal, and in the West Indies. Walter Washington deLacy in Montana. Courtesy of John DeLacy. The earliest Hugh de Lacy left Normandy and came to England along with William the Conqueror. An early Walter de Lacy fought in the battle of Hastings in 1066. A grandson, Hugh de Lacy, received a Scottish royal land grant in Ireland in the 12th century and became the Lord of Math. 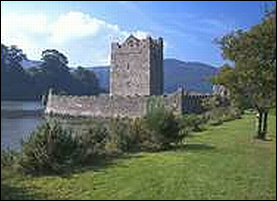 His son, also a Walter, became Earl of Ulster and father and son built a castle or two. In the late 18th century, William Charles Lee became "impoverished," but he married a Portuguese woman who was a lineal descendant of the Portuguese general and explorer, Vasco de Gama, the first man who sailed the whole length of Africa and rounded the Cape of Good Hope in 1497 and whose forces conquered part of India. Lee built his house and grounds in Norfolk in about 1800. Walter was the son of Irish parents, William and Eliza deLacy; he died when Walter was nine and she died when he was 13. A pair of maiden aunts and a bachelor uncle raised him and the uncle moved to Emmetsburg, Md., while Walter attended Mount Saint Mary's Catholic College, where he specialized in mathematics and French, Portuguese, and Spanish. That education would serve him well later when he taught Army cadets and worked at mines in New Mexico. (For more information about Emmetsburg, see this story about Dr. Andrew S. Shorb, an infamous character in the life of Fairhaven's Dan Harris. His uncle obtained an appointment for Walter to the West Point Military Academy, but due to bureaucratic bumbling another man with a similar name took his place. The famed West Point Professor Dennis Hart Mahan (1821-1870) offered to teach Walter civil engineering privately and without charge. Soon, other professors also taught him topographical and mathematical drawing. After his studies he was offered a position as rodman and leveler with the Illinois & Central Railroad (the same job that Sedro-Woolley engineer Albert G. Mosier took with the Northern Pacific a generation later). When the railroad funds dried up, Walter went back to West Point to teach French (with a commission as captain) and then he taught French, Spanish, Portuguese and mathematics to prospective U.S. naval officers aboard various men-of-war ships at sea along the coasts of South America, the West Indies and Africa. That was before the U.S. Naval Academy was established at Annapolis, Maryland, in 1845.
deLacy's Mexico period In 1846, Walter conducted Government surveys along Lake Superior when a group of wealthy industrialists hired him to search for abandoned Spanish silver mines in Texas and new Mexico. He had extended the search to northern Mexico when the Mexican-American War broke out. Although he acted as a volunteer in several skirmishes during the war, he was promoted to the rank of colonel. After the war he joined a detachment of Texas Rangers when their leader, Jack Hayes, was assigned to locate a road from San Antonio to Chihuahua, Mexico. At that point his skill with topography proved invaluable as the party of 70 men encountered deserts that white men had never traveled before. At one point they wandered for 80 days, with only 25 days of rations, because the hired guides proved to be incompetent. They finally stumbled upon the old Comanche Trail and reached San Carlos, Mexico, which is today a beachfront subdivision of the port city of Guaymas, in the state of Sonora, on the Sea of Cortez. That experience of living off the land and charting new territory would form a backbone for deLacy's many challenges in new territory over the next three decades. The rangers returned to San Antonio but deLacy decided to stay in the region, which was then encompassed by a series of huge cattle ranches. While traveling as a merchandise trader on mule back, deLacy chanced upon an Apache chief who soon became his friend and introduced Walter to the Bolson de Mapimí (or Comarca Laguner) river basin which is located in the Mexican Plateau (west-central) and centered on the state of Durango, then the least known area of the country. The basin is bounded by the Sierra Madre Occidental to the west, and by the basin of the Conchos River, a tributary of the Rio Grande, to the north, and the water system is endorheic, or self-contained, with no outflow to other bodies of water. From the Memorial: ". . . he discovered while there was an Indian training school, where the boys were taught to imitate the howl of a wolf, the hoot of an owl, the cries of other animals and birds, and other features of Indian warfare." Following that, he settled as a trader for a year or two at the Presidio del Norte, where the Seventh Mexican Infantry and the Chihuahua Lancers were stationed. In 1849, deLacy returned to San Antonio and joined a party of U.S. topographical engineers who set out on an expedition along the Texas and New Mexico frontier to determine possible sites for military posts. His earlier experience was repeated as the party missed locating the Pecos River and wandered over the dry prairies without water for five days, while some of the men were driven to insanity. They were only saved after the mules' keen sense of smell led them to a natural stream. Continuing on to the Rio Grande River, the party encountered a band of Apaches intent on wiping out the expedition, but the war party included some members of the tribe whom deLacy met while at Mapimi, so deLacy's group was allowed to leave. After traveling to New Orleans in 1850, deLacy was hired by a railroad developer to act as a hydrographic engineer to survey a proposed railroad route across the Isthmus of Tehuantepec, the narrow neck of land in the state of Oaxaca in south-central Mexico. After seven months of that assignment the New Orleans and Jackson Railroad hired him for a three-year siting-survey, during which he met an engineer named Benjamin H. Greene, who three decades later would be Walter's boss in Montana. In 1854, deLacy joined a party that surveyed the 32nd parallel of latitude from San Antonio, Texas, to San Diego. That territory included the Gadsden Purchase (or the Venta de La Mesilla in Mexico), a 29,670 square-mile region that the U.S. government bought from Mexico in 1853 for $10 million and which today encompasses the southernmost parts of the states of Arizona and New Mexico. 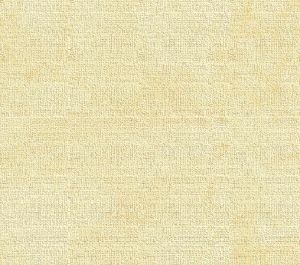 A subsequent treaty ratified by the U.S. Senate and signed by President Franklin Pierce in 1854 included lands south of the Gila River and west of the Rio Grande in the Mexican state of Sonora. DeLacy continued on to San Francisco, where his old Ranger friend Jack Hayes was then Surveyor-General, and Hayes in turn recommended Walter in 1855 to the governor of the new Territory of Washington, Gen. Isaac I. Stevens. Stevens had his hands full of Indian Wars at the time and he needed an experienced Indian-hand like deLacy. The Cayuse War broke out starting in 1848, following the earlier massacre at the Whitman Mission, and over the next seven years skirmishes erupted all over the region. The Yakama Indians lived along the Columbia and Yakima Rivers on the inland side of the Cascade Range. The tribe had established a long trade relationship with the Hudson's Bay Company (HBC), based out of Forts Vancouver, Walla Walla and Okanagan dating back to the first trade with whites via the traders of the North West Company. The tribes bristled under the different attitudes and policies by the officials who came along with the flood of white settlers into the Oregon and Washington territories during the 1840s and '50s. In 1855, Stevens and Joel Palmer, Indian Superintendent of the Oregon Territory, were determined to enact treaties with the Walla Walla Council — The Walla Walla, Umatilla and Cayuse tribes, who were coerced to move from 4 million acres of tribal lands to a reservation in northeastern Oregon, which was eventually reduced to 95,000 acres. In another treaty, fourteen different tribal groups agreed to move onto the Yakama Indian Reservation, and in still another, the Nez Perce Indians were moved to a reservation that included parts of southeastern Washington, northeastern Oregon, and west-central Idaho. In that same year prospectors discovered gold on the recently established Yakama reservation, and the Yakima War soon broke out. Walter changed to his Army hat as he was commissioned adjutant of the Second Battalion, Washington Territory Volunteers, that engaged in a dozen battles with Indians. The war raged on until August 1856, when future-Civil War General Robert S. Garnett (Gettysburg) supervised the construction of Fort Simcoe (now a state park southwest of Yakima) as a military post. During the three following months Colonel deLacy was engaged in making a trail from Whatcom to [the] Thompson River, when the Frazier [Fraser] River excitement was on. His only companions were Indians, and when provisions gave out, for four days they subsisted on the bark of pine trees. Upon returning to Whatcom the Colonel found himself famous. During his absence the population had increased from six hundred to six thousand. He was welcomed with a salute of one hundred and a public dinner. The mines proved a failure, and the glory of the expedition was all the compensation he ever received. By the fall of 1858, the thousands of gold-seekers camped out on Squalicum beach at Whatcom had dwindled down to hundreds and then to a couple of dozen. On March 3, 1859, Congress appropriated $100,000 "for the construction of a military road from Fort Benton to Walla Walla," and more was appropriated for the project in May 1860. Gov. Stevens commissioned deLacy to construct the Mullan Road across the North Cascades to Fort Benton at the head of navigation on the Missouri River. Lieutenant John Mullan of the Second artillery regiment led the combat troops in defense against possible Indian attacks while deLacy and other specialists surveyed the Columbia and Snake rivers in the far-eastern parts of the Territory, including the area that would become parts of the present states of Idaho and Montana. In the winter of 1859, the detachment marched eastwards and surveyed a possible northern transcontinental railroad route. One day deLacy rode alone and lost his way, making a "solitary bivouac in Last Chance Gulch, where now stands the City of Helena." When the party reached Fort Benton, deLacy joined a company of 400 troops en route back to the Pacific Coast. He stopped at Fort Walla Walla and was discharged there in 1860. The gold bug was biting hard in those years and even the surveyor colonel got bit. He joined three other men who prospected in Montana but nothing came of it. Instead, he returned to fitting pack trains, as he had earlier in Mexico, this time between Walla Walla and Gold Creek, Montana Territory. He spent the winter of 1862 at Fort Owen near Bannack. His career in Montana The spring of 1863 marked the beginning of his eventual civilian career, with only occasional Army assignments. He organized an expedition to explore the South Snake River, traveling upstream to the head of the river, through Jackson's Park and then they discovered a "beautiful sheet of water [which] was very properly named deLacy," (Memorial) but years later was renamed Shoshone Lake, as we see today. During that expedition, he gained paper-fame as the leader of a party of prospectors, which he called the "40 thieves," through the southwest corner of the Yellowstone region in 1863, where he and David E. Folsom compiled the first map to show "the most prominent features with reasonable accuracy." Folsom was a well-educated Maine Quaker who came out West to the Idaho gold mines in 1862 and matured into a skilled woodsman and professional hunter in the mountain territories. That region in the far northwestern corner of Wyoming was set aside as the first national park on March 1, 1872 and Folsom collaborated with Charley Cook in the first magazine story about the natural wonders of the future park: a piece in the Western Monthly Magazine of Chicago in June 1870. DeLacy's survey work there resulted in his 1864 assignment by the first Territorial Legislature of Montana to prepare the official map that established the counties. But first he returned to Fort Benton that year to lay out the growing town site. In 1865, he also laid out the town sites of Deer Lodge and Argenta in Montana, again following the same path that Albert G. Mosier would a generation later in Skagit County. During the Montana Sioux War of 1867, deLacy helped rescue Federal troops at Fort C.F. Smith on the Bozeman trail after he was appointed as Colonel of Engineers for the Territorial Volunteers. DeLacy worked in Montana Territory for the rest of his life as a partner of a surveying and civil engineering firm with Folsom. Besides conducting the public land surveys of Montana, in 1872 he prepared a map for the Northern Pacific Railroad that led to their choice of a route through the territory, and he also surveyed the Salmon River. He was appointed city engineer for Helena in 1883-84. 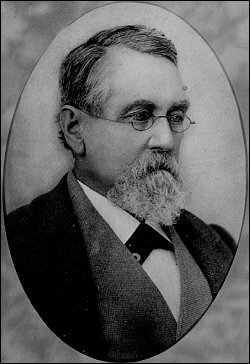 A year later his old railroad friend, Benjamin H. Greene, arrived in Helena as the new U.S. Surveyor-General and he appointed deLacy to be Chief Mineral Clerk and then Chief Clerk in the Surveyor office. He worked almost to the time of his death. DeLacy was an incorporator of the Historical Society of Montana and acted as president of the Society of Montana Pioneers in 1885-86. In early 1892 he became physically impaired and he died of old age on May 13, 1892. He never married. His cousin William deLacy was a well-known citizen of Helena. His maiden aunts who raised him, Mary and Alicia deLacy, died in Norfolk during a raging yellow-fever epidemic in 1862 and his uncle died in New Orleans during the civil war. In 1853 [actually 1859] the government let a contract for the construction of a military road from Fort Steilacoom north to the international boundary. The contract price was $75,000, and requirements were that the road should be so built as to permit of a wagon passing over it. This provision was complied by a wagon being passed over the route on the backs of Indians. The latter could not understand why the wagon was not sent north in a canoe, and they looked upon the performance as an instance of the white men's stupidity. The road crossed the river a little above Sterling and in 1873 the route could still be traced by the blazes on the trees. Many thanks to descendants of Walter Washington deLacy, especially John C. DeLacy of Portland, Oregon. See Issue 42 of the Subscribers Edition for a full profile of deLacy.